3-Fold Cord: Agoraphobic Christians: Why are we afraid to leave the House of God? Agoraphobic Christians: Why are we afraid to leave the House of God? I’ve encountered two different types of churches in the evangelical, nondenominational category. There are those churches who keep Christ and His love locked behind the walls of some spectacular edifice and those that bring the church out to the peoples. Too often Christians practice Christianity inside the walls of their churches and homes, refusing to pattern themselves after the church of Acts. We forget that the church of Christ is not a building but the followers of Christ doing His will in the world. I’ve belonged to a church whose stance on feeding the hungry was to refer people to the local food pantry. This same church took the tithes of its congregates and outfitted their youth rooms with 15 video game stations, had the highest tech sound and light equipment and a gourmet coffee shop where you could enjoy a cup of joe for a small fee. This same church informed us that they decide whether or not to help struggling families based on their tithing record, attendance, and participation in church ministries. I’m not sure about you, but I haven’t found practices like these outlined in the Bible. If my memory serves me we are to be humbles servants, taking care of the widows and orphans, and feeding the poor. We are called to care for others not based on their denomination, tithing, or station in life. We are to pattern ourselves after Christ, who saves us because of our faith in Him and not the works we do. I contrast this with the current church I am attending. This church offers free meals every Wednesday night and hosts a food giveaway each week where they feed hundreds of families. The only requirement to receive a box of free food is to show up at the location and be willing to stand in line. There are no questions asked, no one asks your income, your job situation, and no cares whether or not you attended church on Sunday. The love of all people is preached at this church. A portion of tithes goes to the local mission each month and there is a program to volunteer and donate directly to the local mission. I’ve heard the pastor encourage members to minister to the homeless and to aid the local immigrant population, to invite others into your homes, and to step outside our comfort zones. Unfortunately it seems the former church is the more prevalent example found amongst Bible believing churches. Over the past two months I’ve searched for an explanation for this. If the Bible instructs us to love as Christ loved and to feed the hungry and care for widows and orphans, why do churches so often fail in this? I’ve come to the conclusion that there has been so much focus put on strong faith that many Christians have come to equate a lack of struggles with an abundance of faith. This would assume that the opposite must be true as well: that those who struggle are obviously lacking in faith, and only need to change their lazy, heathen attitudes to be as blessed as we are. This of course is a ridiculous notion, but seems to be the attitude of many inside certain ornate church walls. Our faith has become our god. We need to rely on Jesus, not the strength of our own faith. But I digress. I believe there is a lack of action in today’s churches because they are raising up leagues of arrogant Christians who are believing for miracles and blessings in their own lives while judging the struggles of others. Churches are focusing solely on God’s power and blessing and movements of the Holy Spirit and ignoring the scriptural calling to help the needy. Churches call a fast quoting Isaiah 58:12-15 with out reading Isaiah 58:5-10. We are so focused on our personal experiences and being blessed that we forget to bless others. This year on an episode of Hoarders while breaking down the lean too of a homeless man a clean-up expert stated, “Really, we’re all just four bad decisions away from crapping in a bucket.” I’d agree with that but I’d change it we are all four unfortunate events away from desperation. We are closer to the family on welfare and the homeless man panhandling than we are comfortable with, so we stay away from such situations and pretend that we are superior. But we must have faith in God and His protection and guidance and take heed of the precepts of both the Old and New Testament calling us to reach out to those in need. The following is a very short list of the many places God calls us to share His love by actively giving to the poor. 35For I was hungry and you gave Me food, I was thirsty and you gave Me something to drink, I was a stranger and you brought Me together with yourselves and welcomed and entertained and lodged Me, 36I was naked and you clothed Me, I was sick and you visited Me with help and ministering care, I was in prison and you came to see Me. 37Then the just and upright will answer Him, Lord, when did we see You hungry and gave You food, or thirsty and gave You something to drink? 38And when did we see You a stranger and welcomed and entertained You, or naked and clothed You? 39And when did we see You sick or in prison and came to visit You? 40And the King will reply to them, Truly I tell you, in so far as you did it for one of the least [in the estimation of men] of these My brethren, you did it for Me. My husband and I have welcomed the homeless into our home before, not so we could gloat about our compassion, but because when I looked in the eyes of the gaunt bearded man shivering on the curb, I saw the face of Christ. Hi Carla, sadly I have to say I agree that too many churches have become institutions run by man and not God. What happened to "To him who is thirsty I will give to drink WITHOUT COST from the spring of the water of life" or "whoever wishes, let him take the FREE GIFT of the water of life"?? 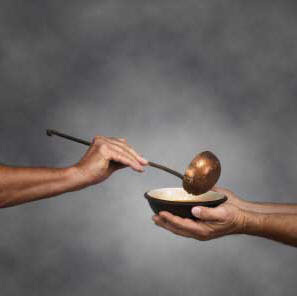 I really believe that we have to understand what God is talking about, not only physically, but spiritually as well, when we are told to feed the hungry and look after widows and orphans. God's word is a spiritual book, yet too often people use it for physical gain and personal edification. I was wondering what church you are currently attending - they sound like a really nice organization. Nice Post! I can really relate to what you are talking about. Strong faith is not being able to know everything about theology and the Bible, but is about living it out in the world we live in everyday. What ARE our works today? It`s a very sobering question. Without the physical evidence of works, faith is to declared dead. AMEN! We've started attending a new church this year. My oldest son is going out on his first mission trip, LOCALLY! I am thrilled beyond belief. Our mission field is right here, in our own back yards! They are going up to Portland and helping out the homeless for several days. I'm so excited for him, I can hardly stand it and he is actually excited about going. I see God opening his eyes all the sudden to those less fortunate and it's awesome (he's 14 1/2 yrs old). I heard a pastor say one time that he did not allow men to become deacons if they did not tithe regularly. Well one day, someone w/i the church was suggested as deacon (or other positions w/i the church) and the pastor said,"No, he doesn't tithe." Turns out that man gave cash each month as his tithe so that others wouldn't know it was from him. Just goes to show how sometimes we don't see the bigger picture because we are so focused in on our own "rules". Please be sure to leave a comment, feedback is very important to us!